A map of ​how much snow it takes to cancel school across the U.S.
How much snow does it take to cancel school in your area? 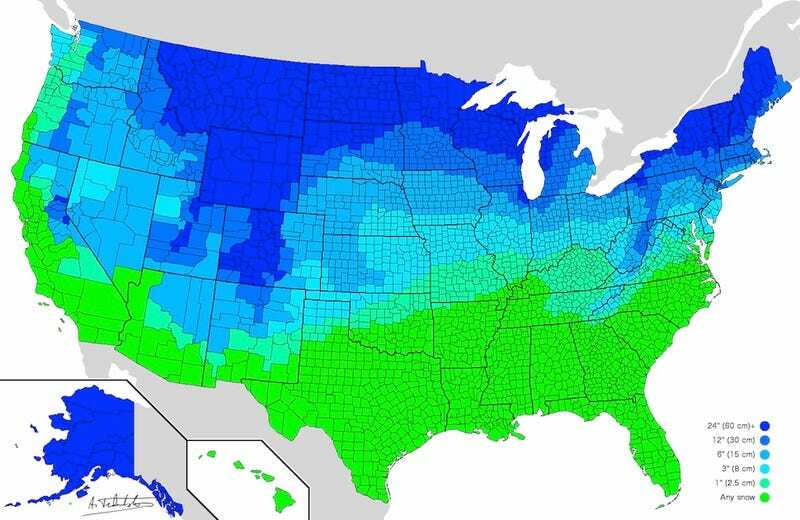 This map takes a look at just how much snow around the country it takes to have a snowday. Redditor atrubetskoy made this map by using a combination of local news reports, a survey, and average snowfall levels from NOAA maps to make an approximation of the differing levels of snow it takes to call off school. While the map is based on hundreds of data points, it is by no means considered to be 100% accurate, as atrubetskoy explains himself. Still it's a fascinating overview of the different kinds of weather people view as "normal" across the country. As you can see, the entire state of Alaska often refuses to even consider not getting out of bed for anything under two feet, while in the very edge of the southern lower 48 (where the snow is much sparser) any snow at all can cancel school. Of course, there's going to be a lot of variation within areas and across days, not to mention winter closings that have much more to do with the dangerous levels of cold we've been experiencing than the snow. But what do you think? Does this map match up with what you've seen in your area? And what's the procedure for weather-cancellations in your neck of the woods?